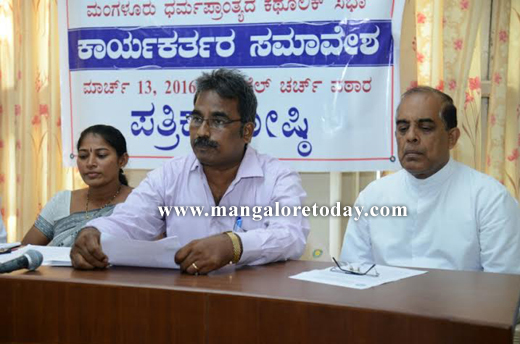 Mangalore Mar 11, 2016: Catholic Sabha Mangalore Pradesh will organize a convention at Bondel Church premises on Mar 13.Speaking to the Press at Bishop House on March 11, Friday Catholic Sabha PRO Lancy D’Cunha said that Catholic Sabha has over 10,000 representatives and 102 units in the Diocese. Having its head office at Bishop House, the Sabha has been involved in community service from past 37 years. He also said that, over 2,000 representative are expected to participate in this convention, Former president Walter D’Souza, MP Oscar Fernandes, MLA JR Lobo and MLC Ivan D’Souza will be chief guest on the occasion. Meanwhile Catholic Sabha website and a documentary will be launched during this convention, said Lancy. Catholic Sabha President Flavy, Spiritual Director Rev.Mathew and Rev.William Menezes were present.